This is a two-legs walking robot with six servo motors and six servo motors attached to the legs of the robot, moving six servo motors onto the robot arm. It's a robot that can learn how to perform an.. This exciting new humanoid robot offers educators, students and robotic hobbyists a complete robot package. The stable Huroi-II can walk, do flips, cartwheels, dance moves and once programmed. Availab.. The exciting new humanoid robot offers educators, students and robotic hobbyists a complete robot package. The stable Huroi-II can walk, run, do flips, cartwheel, dance moves and once programmed. Avai.. The Extreme Quadruped offers the most sophisticated design available today. The three degree of freedom(DOF) leg design means this robot can walk side to side(Crab walk), and it can keep the feet movi.. The robot offers the most advanced leg design available today. The three DOF(Degree of freedom) leg design means this robot can walk in any direction! The robot uses 18 Robot Servos for the legs. The .. This robot is a very unique hexapod walker. The three DOF(Degree of freedom) leg design provides the flexibility required to walk in any direction! The robot uses 18 robot servos for the legs. This ki.. The 5-jpint robotic arm delivers objects fast and accurately, and offers repeatable movement. 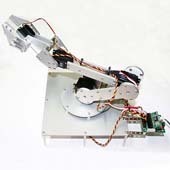 This robot is featured with base rotation, shoulder, elbow and wrist motion, and a functional gripper. The..